The Knit Tree offers the Personalized Showroom as a special place to order those unique hand loomed knits especially for you. 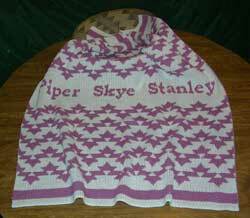 Knit baby clothes personalized with names and knit in your color choices can be ordered in our online store catalog. These baby layettes make perfect heirloom gifts for baby showers. We offer other categories of logo knits for business and clubs. Knit blankets, caps, scarves, sweaters, and much more can be hand loomed with your logo or special design. Native American Designs and Symbols are Personalized in Flag Blankets and many other knit gifts. 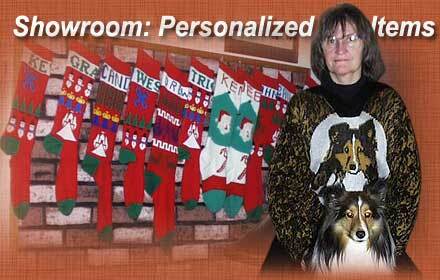 Photo of Sharon with her sheltie Tori enjoying the holiday with all the family Christmas socks. The gift of a Christmas sock with the baby's or child's name on it is another perfect gift and tradition to start in your family. As your children grow and become involved in school events, we support their sports and activities with Mascot stadium blankets are a must to keep you warm as you root your favorite team on to victory. Then time passes on and weddings and anniversary's are honored with special personalized place mats. Your children go off on their own and start their own careers. Now we even have those unique business or club logo blankets, caps, or scarves. Personalized knits make useful and memorable keepsakes from knit baby clothes to school spirit knits to special holiday gifts and hand loomed knits for all occasions to remember. Business and Club Logo knits are treasured by family and friends. The Knit Tree's Native American hand loomed blankets and knit baby clothes also are personalized with babies name in the layettes and special color choices in the caps, scarves, blankets, and sweaters. 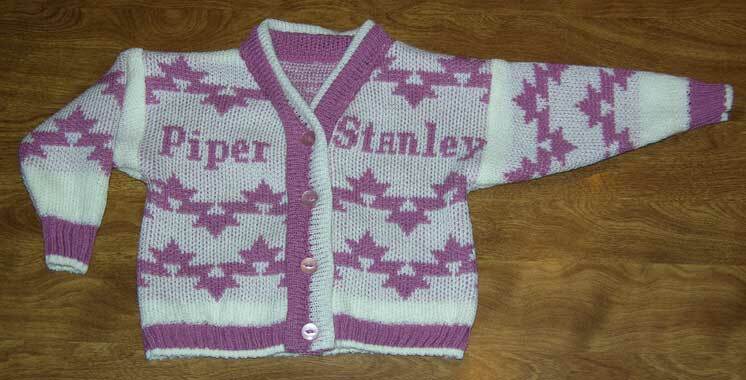 A Life Time of Memories are treasured in Personalized Knitted Items to Pass down to Future Generations. The Knit Tree often gets requests for Christmas Socks like Gramma use to knit for the family to welcome each new baby into the family. Examine our samples below, then enter our online knit store to order your Personalized Knit! Remember: if you have a special request, contact us to see if we can make your personalized knit a hand loomed reality! - Our aim is to Please you with a unique knit item. Personalized baby sweater with the Native American design Morning Star. This personalized knit baby blanket is crib weight and size. It comes in several different Indian motifs: Morning Star, Friendship, and Sports Tattoo. The knit baby blankets are also offered as sets with a blanket and matching cap. The matching knit morning star baby sweater can have a name on both sides or just one. The name is replaced with the morning star Native design if desired. We offer options with our knit baby blankets, knit caps, and knit baby sweaters. 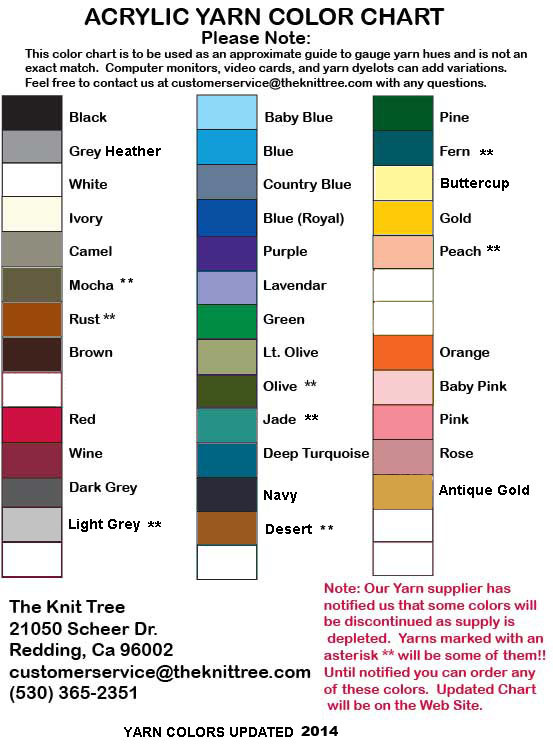 You can choose your own colors from the acrylic yarn chart and the sweaters come in sizes new born thru 24 months. 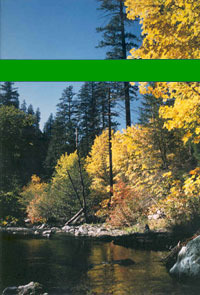 Hand loomed in Northern California with Love and Pride! Knit memory blanket, Memories through Nature Poem. Note from the designer and owner of The Knit Tree, Sharon Nani. "I designed this special blanket commemorating the memory of my mother Betty Pukis, who passed away on Dec. 4th 2009 after years of struggling with the challenges of lymphoma. She loved to write poems and this is one of my favorites. I knitted this Memory Blanket as a presentation to give to my Dad at my mother's Celebration of Life. 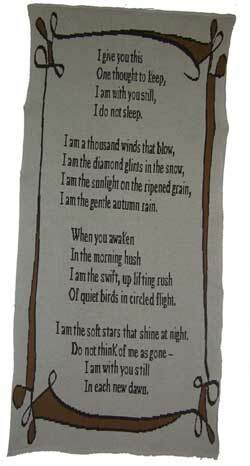 The poem is so fitting for this occasion." All monies from the sale of this blanket will go to buying supplies for The Little Knitters Program. My mother loved to wear all the slippers knit by various Little Knitters through the years. Order the Life Blanket in our Online Catalog or Contact Us if you would like a Memory Blanket with your own Poem Verse or Message Contained. This blanket has the maximum space allowed, but smaller 1 verse lap blankets can be ordered for less cost dependant upon size. The blanket on the right has another favorite poem memories in nature, that is perfect for those who have lost a loved one. Memory Blanket Knit Especially For You. Personalized knit Christmas Socks are a great family If you are in a hurry tradition. Enter our Store and look in the Personalized category for your choices. Fill in the "First Name" form: 7 letters max for the big font – more letters = smaller font! All special orders take 2-4 weeks dependant upon our backlog – so order early. contact us to find out the approximate ship date . 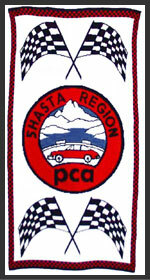 Photo of the knit logo blanket for Shasta Region PCA. All we need is the picture of your logo and we can handloom a knit blanket, sweater, cap, or more with your personal logo just for you! The image or the knit logo blanket at the right was hand loomed for the Shasta Region Porsche Club a division of the Porsche Club of America. 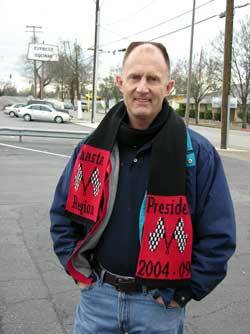 Classic Car clubs are welcome to submit their request for their own knit logo product. Remember only a person authorized to order the copyright logo can place an order for a personalized knit product. All our products are hand loomed with pride using high quality acrylic yarn for easy care and economical price. Double Jacquard knit for stability and warmth. We knit superfine merino wool by special request. Of course, prices vary dependant upon fiber, and wool is not available in all colors! If you have other desires: logo caps, scarves, etc. - let us know, perhaps we can accommodate you. Merino Wool Car Club Scarf in photo to the right makes a great gift honoring officers at special club presentations..
All logo designs must be submitted by someone authorized to order copyright logos. All logo designs will be submitted to the purchaser with a computer proof for approval before the product is knit. Dependant upon the complexity of the design, there may be a design fee which is refunded upon an order for the hand loomed knit product. These make great gifts for your special employees or items for your club store! Volume pricing is available for your club store..
Sizing can vary dependant upon your design. The special request for this personalized blanket and visor cap designed by Sharon Nani, came from Chantal, a mother of a boy scout in The Order of the Arrow, with particular interest in the Leni Lenape, or Delaware People. Chantal said ""White Hawk In Battle" is the name Gavin has chosen to distinguish himself within tribal ceremonies during Scouting events. He will wear the blanket & cap to "Order of the Arrow" & "Tribe of Lone Bear" ordeals, & encampments and some ceremonies (if he is not wearing feather regalia).... as well as regular scouting camp outs." 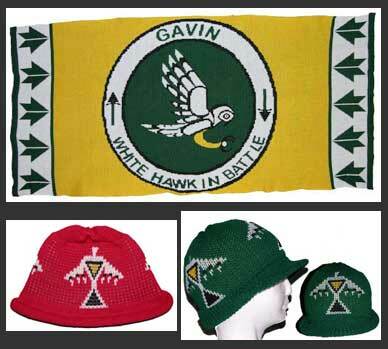 White Hawk in Battle blanket is inspired from a Woodlands Indian design. Read more about this blanket in the product description in our On line shopping catalog. Read more about the mission of the Order of the Arrow at its main web site.
" Hawk - Strength, Foresight, Truth, Clarity, Agility, and Dignity. Gavin, a Welsh, English name is derived from Gawain and means White Hawk of Battle. Gawain was a knight of King Arthur's Round Table. The Native Americans know the hawk to be a messenger, and protector. The hawk will teach us how to fly to great heights while remaining grounded. Through its flight it communicates with both humans and the creator spirit. It awakens our vision and inspires us to a creative life purpose. Though the hawk knows that not everything good is visible at all times it knows that with time and patience the good will show itself to allow us to continue our own journey. The White Hawk (waspu Meechagalanne) is noted for the black band of color on its wing, and tail feathers. It has a black beak and yellow legs. The white symbolizes all positive aspects in life and the black stands for the Great Mystery. Yellow carries the meaning of warmth and reminds us of the sun that rises each and every morning." Contact Us to order your special Personalized design.